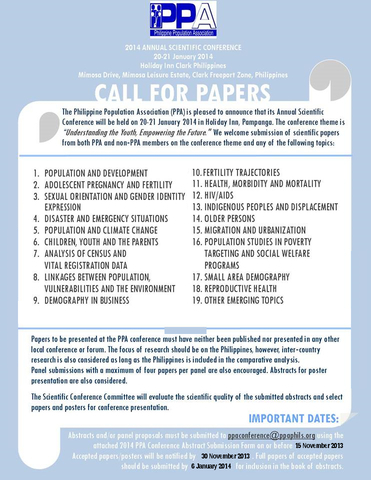 Below is the Call for Abstracts’ poster by the Philippine Population Association (PPA) for its annual scientific conference set at Holiday Inn, Clark, Pampanga. Demographers, social scientists, academicians, other professionals and students around the country (and abroad) engaged in population-related activities are expected to attend the said event. Deadline for submission of abstracts is extended to 18 November 2013. 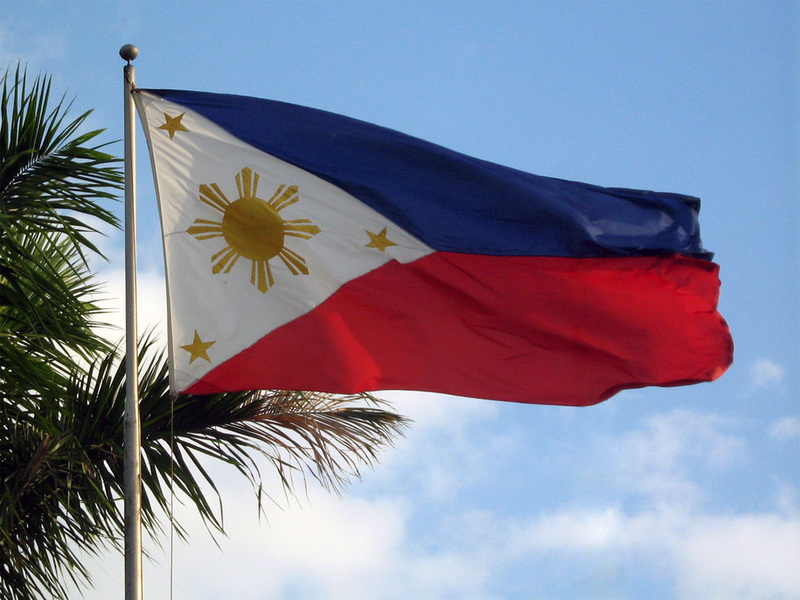 Undeniably the Happiest Pinoy at Anytime! He is the father of Brina Kei Maxino. 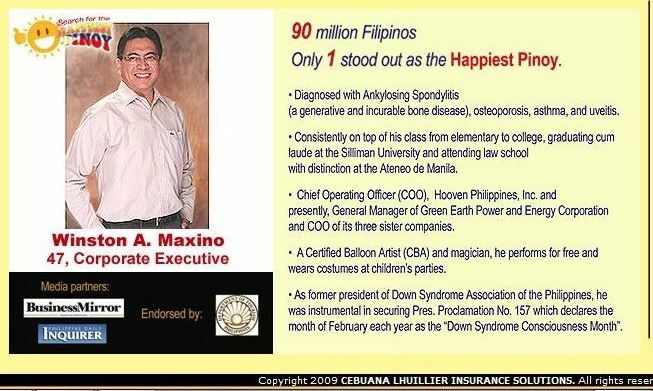 So, who on earth is Brina Kei Maxino? The second child among three daughter-children of the father above, Brina was born with Trisomy 21 or Down Syndrome BUT managed to emerge victorious despite the disability. As just shown on Magpakailanman, a show on GMA hosted by Mel Tiangco, despite her health condition Brina was able to enroll in school with the rest of the children her age. And she graduated as high school Valedictorian! I was really mesmerized as I watched the show and I couldn’t stop myself from googling about Brina and her father. True enough I was able to see and read great stories about them and their achievements. Undeniably, it is the family’s positive attitude, optimistic nature and joyful relationship that fueled Brina’s optimum development. Parents can learn a lot from Brina’s story. How crucial is our role as parents in allowing our children’s potentials reach the apex. Unconditional love to our children is paramount. It is non-negotiable. And aside from its natural existence within our hearts, it takes efforts for us to maintain it and manifest it in our words and actions on a daily basis. This is true to children without any disability, truer to those with disability. It doesn’t go unnoticed in the show how the family braved life’s challenges with strong faith. Members of the family did not just depend on each others’ goodness and strength but more on the power above and beyond them. The Maxino story should encourage every parent in the grueling tasks of parenting children in whatever situation they are into. With an international codename Haiyan and locally called Yolanda, this name will be remembered in history as the strongest typhoon the world has ever have, at least until 7 November 2013. Yolanda has also been used as a name just 3 years ago to a non-tropical cyclone that struck and flooded eastern Europe in 2010. Looking at the map made by Rappler, one can see why this typhoon is described as the strongest one ever that hit the world. 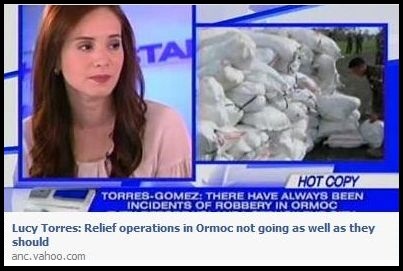 It is even stronger than “Pablo,” destroyed properties and ended lives in most parts of Visayas and Mindanao in December 2012. Barely a year from that experience and here is Yolanda. It must be noted that Visayas has just been lambasted weeks ago by a strong earthquake and still recuperating from the losses and now here is the strongest storm. The typhoon has such a wide scope that ranking of signals reaches to 4 and involving the whole country in various signal. This afternoon, the Department of Education in Iligan City already released a directive of “no school” tomorrow, Friday, 8 November 2013. Prayer brigades have been started in various social media. 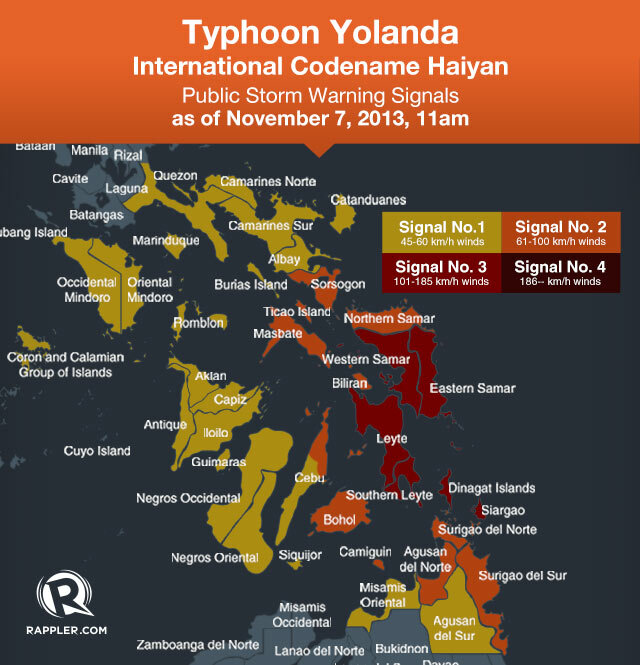 Local residents can not help but compare typhoons Sendong, Pablo and this coming Yolanda. While conversing and recalling events, there is that inevitable tinge of apprehension and fear. It will help if we visualize a peaceful evening free from storm. This may give the impression to Yolanda that she is ignored and unwanted she has to stay away. The country Philippines has had typhoons all year round named from letters A to Z. Typhoons are quite predictable, but not the earthquakes. Lately, the centuries-old churches in Bohol were destroyed by a really strong earthquake. When the Bohol earthquake occurred, here in Iligan City there was also that shake at the same time. As it happened, I was gripped with fear watching at my 3 kids while my mind’s trying to figure out what will I do to keep us all safe. 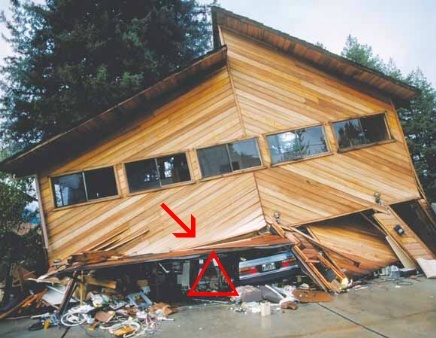 The triangle principle during earthquake came to mind. I remember receiving an email int he past about earthquake and how it’s supposed to be dealt with. For a long time, it is engraved in my mind that we need to look for a sturdy table to hide beneath, open areas to run to, and the like. 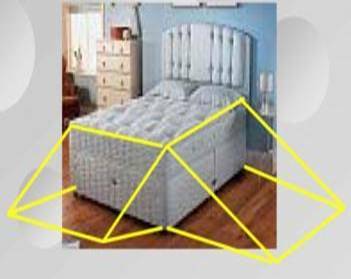 But the triangle principle debunks the below the table instruction. My name is Doug Copp. I am the Rescue Chief and Disaster Manager of the American Rescue Team International (ARTI ), the world’s most experienced rescue team. The information in this article will save lives in an earthquake. The first building I ever crawled inside of was a school in Mexico City during the 1985 earthquake. 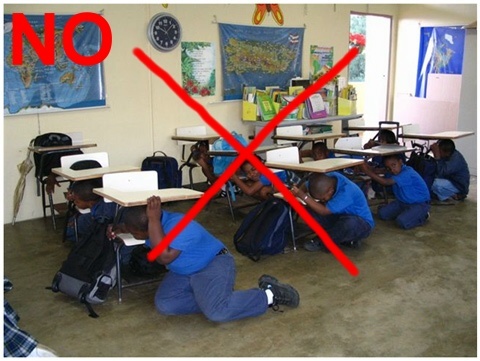 Every child was under its desk. Every child was crushed to the thickness of their bones. They could have survived by lying down next to their desks in the aisles. It was obscene — unnecessary. Simply stated, when buildings collapse, the weight of the ceilings falling upon the objects or furniture inside crushes these objects, leaving a space or void next to them – NOT under them. This space is what I call the ‘triangle of life’. The larger the object, the stronger, the less it will compact. The less the object compacts, the larger the void, the greater the probability that the person who is using this void for safety will not be injured. 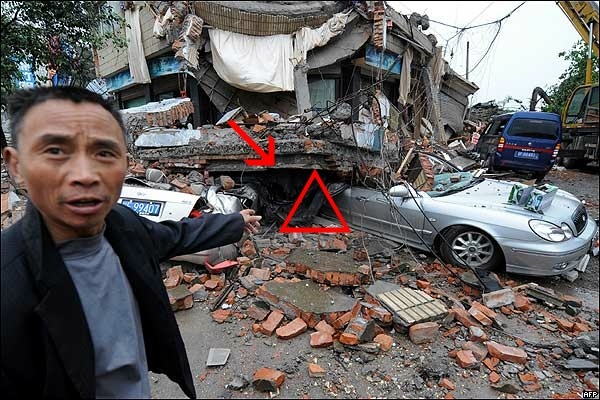 The next time you watch collapsed buildings, on television, count the ‘triangles’ you see formed. They are everywhere. 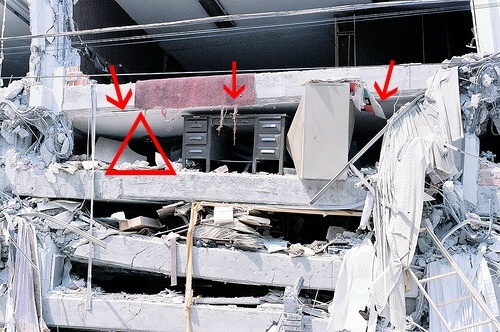 It is the most common shape, you will see, in a collapsed building. 1) Most everyone who simply ‘ducks and covers’ when building collapse are crushed to death. People who get under objects, like desks or cars, are crushed. 2) Cats, dogs and babies often naturally curl up in the fetal position. You should too in an earthquake. It is a natural safety/survival instinct. You can survive in a smaller void. Get next to an object, next to a sofa, next to a bed, next to a large bulky object that will compress slightly but leave a void next to it. 7) Never go to the stairs. The stairs have a different ‘moment of frequency’ (they swing separately from the main part of the building). The stairs and remainder of the building continuously bump into each other until structural failure of the stairs takes place. The people who get on stairs before they fail are chopped up by the stair treads – horribly mutilated. Even if the building doesn’t collapse, stay away from the stairs. The stairs are a likely part of the building to be damaged. Even if the stairs are not collapsed by the earthquake, they may collapse later when overloaded by fleeing people. They should always be checked for safety, even when the rest of the building is not damaged. 8) Get near the outer walls of buildings or outside of them if possible – It is much better to be near the outside of the building rather than the interior. The farther inside you are from the outside perimeter of the building the greater the probability that your escape route will be blocked. The entire world is experiencing natural calamities so be prepared! In 1996 we made a film, which proved my survival methodology to be correct. The Turkish Federal Government, City of Istanbul, University of Istanbul Case Productions and ARTI cooperated to film this practical, scientific test. We collapsed a school and a home with 20 mannequins inside. Ten mannequins did ‘duck and cover,’ and ten mannequins I used in my ‘triangle of life’ survival method. After the simulated earthquake collapse we crawled through the rubble and entered the building to film and document the results. The film, in which I practiced my survival techniques under directly observable, scientific conditions , relevant to building collapse, showed there would have been zero percent survival for those doing duck and cover. 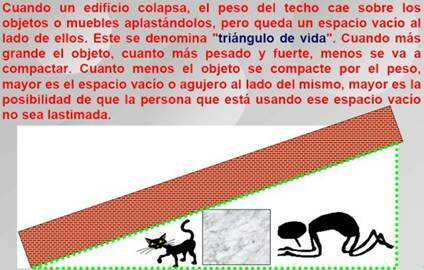 There would likely have been 100 percent survivability for people using my method of the ‘triangle of life.’ This film has been seen by millions of viewers on television in Turkey and the rest of Europe, and it was seen in the USA , Canada and Latin America on the TV program Real TV. American Rescue Team International（ARTI）is said to be the World’s most experienced rescue team and disaster management-mitigation organization.